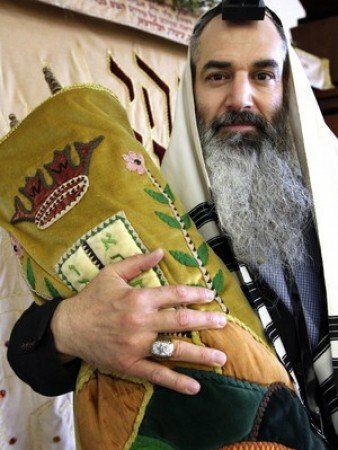 Shlomo Veingrad's broad shoulders are wrapped in a prayer shawl, and at six-foot-five, he towers over the other Orthodox Jewish congregants at the Coral Springs Chabad. 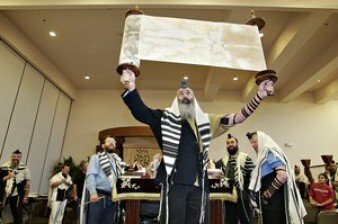 He hoists the heavy Torah scroll over his head with ease: Those same long, mighty arms spent seven years shoving aside NFL defensive linemen to clear space for Troy Aikman and Emmitt Smith. As an offensive lineman for the Green Bay Packers and the Dallas Cowboys from 1986 to 1993, Veingrad, 44, a Miami Sunset High grad, wore giant shoulder pads under his jersey. Now, his undergarments are tzitit -- knotted fringes that serve as a reminder of his commitment to Judaism. He was known as Alan back then, before he wore a yarmulke on his head, before he grew a long thick beard, before he kept kosher. He studied playbooks instead of scriptures. His inspiration was Jimmy Johnson; his most prized possession was his Super Bowl ring. and thus began his metamorphosis. After spending most of his life in a violent, macho world where men bragged about material possessions and sexual escapades, Veingrad was intrigued by the simpler, gentler Orthodox way of life. He went to Israel and came back wearing a yarmulke and calling himself by his Hebrew name, a man transformed. ''I'm one of those guys who was always starved for inspiration, had every Vince Lombardi book, Zig Ziglar tapes, and I realized the Torah was not a boring history book, but a very inspirational guide to life,'' Veingrad said. ``It's a battery pack. 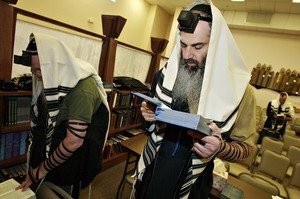 Local Chasidic rabbis say his bigger-than-life appearance and his engaging personality make him an inspiration. ''He has been able to channel that dedication and commitment he had for football to Judaism, while living in a very secular environment,'' said Rabbi Schneur Kaplan of the Fort Lauderdale Downtown Chabad. Said older brother Steve Veingrad, a Miami-Dade police officer: ``I was shocked at first, thought it was like a cult, but now I see he's found happiness and tranquility, and I'm proud of him. The old Veingrad's perfect Saturday was spent with beer and buddies watching college football. Now, he walks to synagogue for Sabbath services with his family. Veingrad fully observes the day of rest -- which means no driving, cellphone, television, cooking and no flipping light switches. He spends the day praying, studying and bonding with his three children. Veingrad was born Jewish and had a bar mitzvah at age 13 at Temple Zion in Kendall. Like many secular Jews, his family lit Sabbath candles on occasion, went to High Holy Day services twice a year, but that was about it. 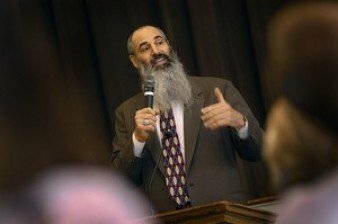 ''The bar mitzvah should be an entry to Judaism, and for me it was an exit,'' he said. Though he wasn't religious, he felt excluded at times. One of the few Jewish players at Sunset, Veingrad would bow his head in silence when Fellowship of Christian Athletes representatives led the team in the Lord's Prayer before practice and games. Veingrad said he never experienced anti-Semitism on the football field. His teammates at college, now known as Texas A&M at Commerce, invited him to fish and ride horses on their ranches. A few years ago, he was inducted into the school's Sports Hall of Fame, and they rescheduled the ceremony to accommodate his Sabbath observance. During his tryout for the college team, Veingrad admits, he pulled a fast one on the coaches in the 40-yard dash. When the coach with the stopwatch turned his back to walk toward the finish line, Veingrad took a gigantic step forward. ''Ready, Set, Go!'' the coach yelled. Veingrad just made the required time of 4.9 seconds and got a scholarship. He and coach Ernest Hawkins would laugh later about his 39-yard-dash. Veingrad considered the NFL an unrealistic goal. But an assistant coach said NFL scouts would like his long arms and height. He kept working out and bulking up and got what looked like a break -- the Tampa Bay Buccaneers signed him as a free agent in 1985. He was cut 10 days later. Another tryout with the Houston Oilers ended the same way. Veingrad bided his time as a student-coach at East Texas State, finishing his degree. Then the Packers called, and this tryout led to five years in Green Bay -- during which he started ahead of Tony Mandarich, a hotshot young lineman. He signed as a free agent with the Cowboys in 1991 for $1.4 million. Always one of the first to arrive at synagogue, Veingrad credits coach Johnson for his punctuality. ''If the meeting started at 7 o'clock, you were expected to be there at 6:50,'' Veingrad said. ``Jimmy said if you got there right at 7 . . . you couldn't switch from cutting up in the hallway with your friends to being in the mind-frame for a meeting. I bring that lesson to the religious world. Johnson hasn't seen the new Veingrad, slimmed 60 pounds to 225 from his playing days, but he isn't surprised the former Cowboy is taking his new calling seriously. Veingrad insists he doesn't miss being a pro -- and rarely even watches football anymore. As for his Super Bowl ring, he wears it only for speaking engagements and important business meetings. ``I loved the games, the challenge, the competition. I was a very intense player, and I loved Sundays. There is nothing like it, can't replace that feeling of coming out of a tunnel in Green Bay, beautiful blue sky, 50 degrees, the smell of beer and brats in the air. Veingrad was divorced from the mother of his three kids a few years ago and remarried Chaya, who is also Orthodox, last month. He works for Silverhill Financial, a commercial mortgage lending company, during the week. On the side, he travels the country giving speeches, mostly to Jewish groups. But he had started to come around by the time he died three years ago. He gave a $100 donation to his son's synagogue, and even more telling was something he said.